Kashoozan is located in Numata town 沼田市, Gunma prefecture. The mountain is 1322 m high. This mountain is about 16 km north of Numata town. It is a sacred place for mountain ascetics. as a Zen temple dates back to the Muromochi period. The founder of this temple, Tenson　Keijun 天巽慶順, practised severe asceticism in the mountains. One of his disciples, Nakamine Chuuhoo Sonja 中峰尊者 Chuho Sonja, was very devote and good at flying. Every night, he flew down to the village at the foot of the mountain and bought some sake 酒 to serve his master. 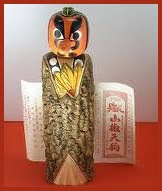 After his own death, Chuho Sonja became a protector Tengu of the temple 護法天狗. "I am Kasho, an incarnation long before the Buddha Shakyamuni. When my time is up, I will go to paradise and help people." Near his bedside the disciples found the mask of a Tengu. Later the priests of this temple had many masks of Tengu made as talismans, some as large as 6 meters high with a nose of 2 meters. They are protectors for road traffic 交通安全. People take one mask home and make a wish. When the wish is granted, they bring the mask back and offer a new one to the temple. Now there are also other types of papermachee masks sold at the temple. 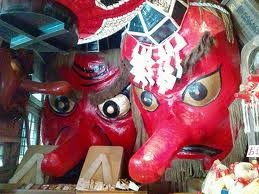 This mask of a Tengu is maybe the largest, there is another one at the temple in Wakayama 和歌山県由良町の興国寺. 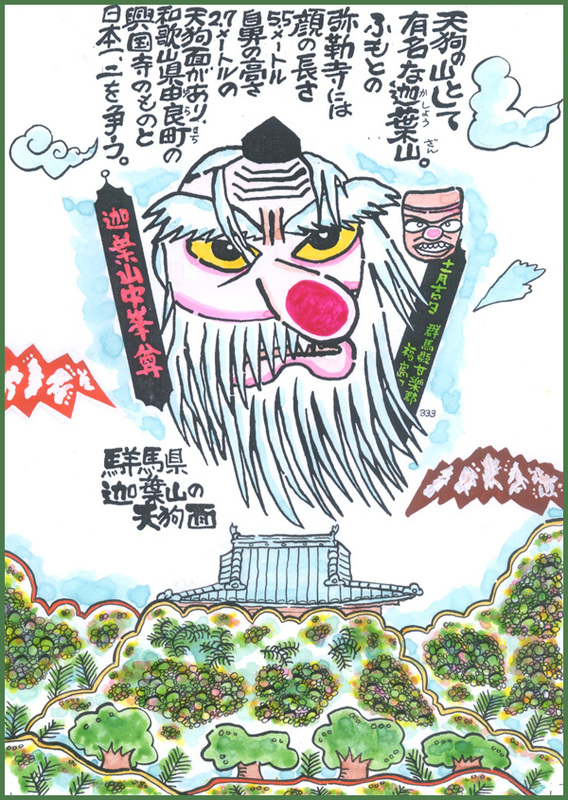 Taken from the legend from temple Miroku-Ji talks about a mountain ascetic who became a tengu goblin. 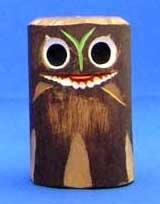 One woodcarver made this image from the mountain pepper.
. Tengu mountain goblins 天狗 . This deity is venerated in many mountain regions of Jooshuu 上州 (Joshu, another name for Kazusa) by the hunters and forest workers. The face of the simple carving has the features of many animals found in the local forest, like bear and badger, even kappa wager goblins or a mimizu earthworm. Each carver had his own image of the animals he wanted to represent. Known as Tengu Mountain, the temple is located at the eastern end of the Tanigawa Gorge, approximately 16 km north of the city of Shibukawa. The mountain is highly regarded as a sacred place (rei'iki) in the Kanto area. In the springtime, the new green foliage is most pleasing and in the summer, one can hear the song of the sacred bird (reicho), called "bupposo 仏法僧" or a broad billed roller (Eurystomus orientalis). In autumn, the whole mountain is vibrant with fall foliage after which comes the snow, covering the area in a white blanket. The temple was first established in the year 848 by order of Imperial Prince Kadowara Ippon, the son of Emperor Kanmu, as a protecting shrine for "Kozuke no Kuni" (present day Gunma Prefecture). It was established under the guidance of the eminent Buddhist priest, 円仁慈覚大師 Ennin Jikaku Daishi of Mt. Hie (Enryakuji Temple near Kyoto). The temple was designated an official tutelary temple to ensure national prosperity and tranquility. When the Buddhist priest Saicho (Dengyo Daishi) returned from his travels in China, he brought with him the doctrines of the Tiantai Sect of Buddhism which became the Tendai Sect in Japan. The Tendai Sect adopted the principle of the threefold truth of Mahayana Buddhism: all things are void and without essential reality, all things have a provisional reality, and all things are both absolutely unreal and provisionally real at once. This threefold truth was elaborated in a collection of sutras formulated by Kasho, a disciple of Gautama Buddha, at Mt. Keisoku in India. 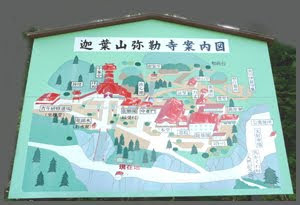 Since the mountain range near Shibukawa resembles the famous Mt. Keisoku where Kasho attained Nirvana, it was decided to name it after him, thereby becoming "Kasho Zan." On this mountain one thousand monks gathered for the first time to chant the sutras and the temple there became known as Kashozan Ryugei'in Miroku gokoku. This event became the founding start for a group of 49 temples which flourished culturally and politically in the Kanto area. In the year 1456, while on a proselytizing journey, the monk, Tenson Zenji visited Jiun Ritsushi whom he greatly respected. 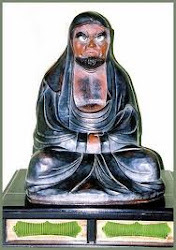 Jiun Ritsushi was impressed by Tenson's Zen philosophy and Zazen practices and was converted to the Soto Sect of Buddhism after a 600 year tradition of following the Tendai Sect. "My transformation is complete. I am the embodiment of Kasho Buddha. I will stay forever on this mountain as a spirit, taking upon myself the burdens of others that they may be at peace." As he said these words, his spirit ascended leaving behind the mask of Tengu. The spirit of Chuho proved to be most efficacious, bestowing blessings on those who interceded with him. He became known as the Kashozan Chinju Chuho Boddhisatva and was revered by many followers. The revered Buddhist monk, Chinju Chuho was converted to the Soto Sect of Buddhism from the Tendai Sect by the monk Tenson. He was outstanding for his efforts to construct temple buildings, his dedication to preaching, and for the assistance he lent to many other priests of his time. He managed to construct grottoes in steep precipitous locations on the face of mountains to be used for meditation and training of monks. 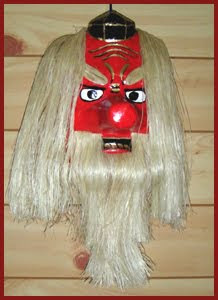 When Chuho died, it is said that he left behind a mask of Tengu. The location of his passing is Anzanho, a place on the temple grounds. A child prodigy, he is revered as Chuho Sonja, however, sometimes more popularly he is known as Tengu. 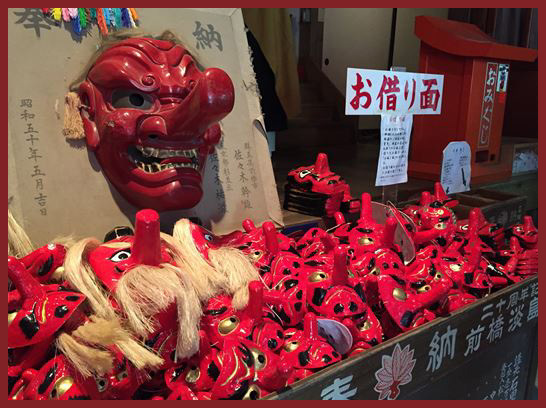 As time passed, he was increasingly recognized as Tengu, and has showered many blessings on his followers. Some of his believers come from places as far away as Saitama, Tochigi, Niigata, Tokyo and even the Kansai area. These believers come for lectures or in groups to pay homage to Chuho. In addition, there are many sacred cedar trees of great age, caves and grottoes, and the "Oshodai," or priest's ledge. All of these natural wonders are of great interest. In 1995 a Special Celebration commemorating the Chuhodo was held during which time the Oratory was opened for all to see for a period of 8 days. It is said that this location was used by the revered monk, Tenson when he converted the temple to the Soto Sect. The spot was used for Zen meditation. The ledge is some 60 meters high. There are other rocks, ledges and caves of interest on the temple grounds. votive tablet with two tengu goblins .
. Buddhabird (buppoosoo 仏法僧) bupposo .
. Regional Folk Toys from Gunma . a Tengu turned himelf into a boy apprentice and lived at the temple Kashozan. Once he went on an errand to 沼田 Numata, which takes about 30 minutes. The head priest had asked him in the morning to go and get some fresh tofu. But today of all days, the boy returned only late in the evening. When he arrived, the priest aksed him what had happened. "Well, you told me to go to Kyoto to get some Tofu, so I went there!" This is a pun on the sound of KYO. The Tengu from Kashozan came to support the 日露戦争 Russo-Japanese War in 1904. A young priest came to the local blacksmith, asked him to make a strong iron club and carried it up to Mount Kashozan. Then a black cloud could be seen, floating from the mountain in the direction of Russia. And when the war ended, the iron club came right back to Mount Kashozan.